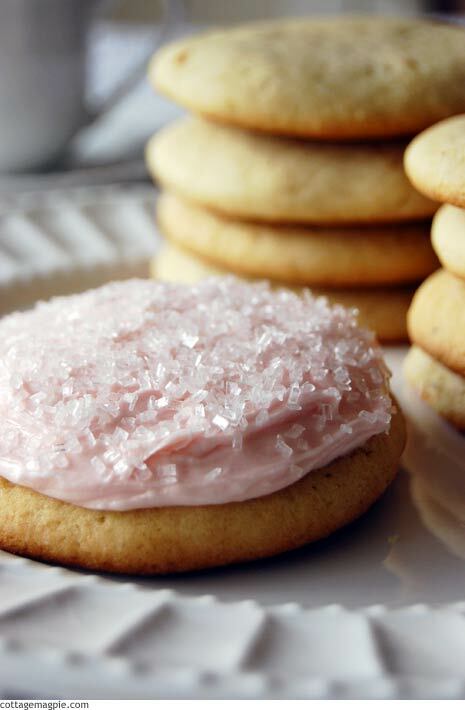 One of my favorite cookies is a sugar cookie, and I like them soft and thick and smothered with buttercream frosting. For me, this is the perfect cookie. 1. Sift the flour, then measure out four cups. Measure the flour by spooning into the measuring cup and leveling with a knife. Don't scoop the flour up with the measuring cup. 2. Sift four more times (yes, four) with the baking powder, soda, salt and nutmeg. Set aside. 3. In a large mixing bowl, cream the fats until smooth. 4. Add sugar gradually, creaming well. 5. Add eggs and vanilla, beat until fluffy. 6. Add approximately 1/3 of the flour mixture, mix until smooth. 7. Add approximately 1/2 of the sour cream, mix until smooth. 8. Continue to add and mix flour and sour cream, alternately, ending with flour. 9. Cover bowl and refrigerate dough for several hours, or until firm enough to shape. I usually leave mine overnight. This dough is very soft, even when chilled, and can be difficult to work with if you aren't relatively patient. Work with small amounts at a time with plenty of flour, and keep the remaining dough in the fridge between batches. It's a little tricky, but the end result is so worth it. 1. When ready to shape and bake cookies, grease cookie sheets and preheat oven to 425 degrees (yes, 425 degrees). 2. Working in small batches, pat the dough out with your hands. Use a rolling pin to smooth the top if necessary. You want the dough fairly thick; a generous 1/4" is what I use. 3. Cut with cookie cutters of your choice, but try to use cutters at least 3" across or bigger. 4. Place on prepared cookie sheets and bake 6-8 minutes, or until just set. 5. Let cool completely on wire rack before frosting. Of course, you could sprinkle them with sugar before baking, but for me, the true treat is eating these cookies with a thick layer of my favorite buttercream frosting.